I had a busy week at work therefor I had to prioritize it. 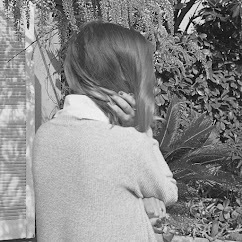 It was a stressful week and probably didn't help the eczema. But I'm taking it as an exercise - not to let others get beneath my skin. And to take all the distance from it that I need once I'm riding back home. I did force myself to some relaxation before going to sleep. And to reading instead of wasting time in front of the screen. Also I decided to juice cleanse. I've tried this before and always have failed. Juice cleansing is boring! I always give up after a day and a half. But as a healthy nutrition is key to skin problems, I wanted to give it a try, to kickstart a new diet. Not that I eat unhealthy stuff. But there're some things that I should give up. I heard and read that dairy isn't good for eczema. Giving up my morning skyr is torture but if it's what it takes then I'm good with it. 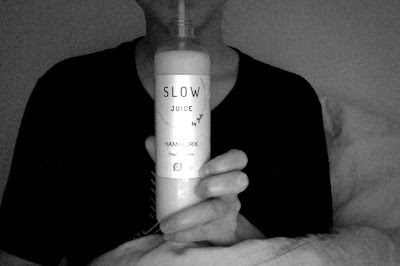 Since yesterday I've been ingesting juices from Slow Juice Copenhagen. Well it's a better experience than expected. Although I'd kill for a my traditional Saturday morning coffee, I must admit that one day already brought positive effects. I feel light and rested. And totally ready to give up the food that supposedly isn't good for me. As for my mind and soul? Oh well, it's the toughest part of the process. But I'm learning here. Also I have an hour scheduled with my reiki healer today. I'm learning to take the time I need to do things. I'm learning to get rid of what's not working. And I'm learning to go towards people wether it's at work or in my private life. Which means I'm learning to actually say what I mean instead of keeping it inside of me. Should I be able to do that easily in 100 days, a big battle will be won. I'm looking forward to celebrating. As for my body, I'm going back to working out tomorrow. I'm excited. Should things be okay with my shin I might try to run again in a week. Running pain free would make me beyond happy.